You could read through more than 800 pages of studies on how to reverse Michigan’s educational decline. Or you can read this cheat sheet. If the size of a problem is measured in pages, Michigan has a big problem with its schools. 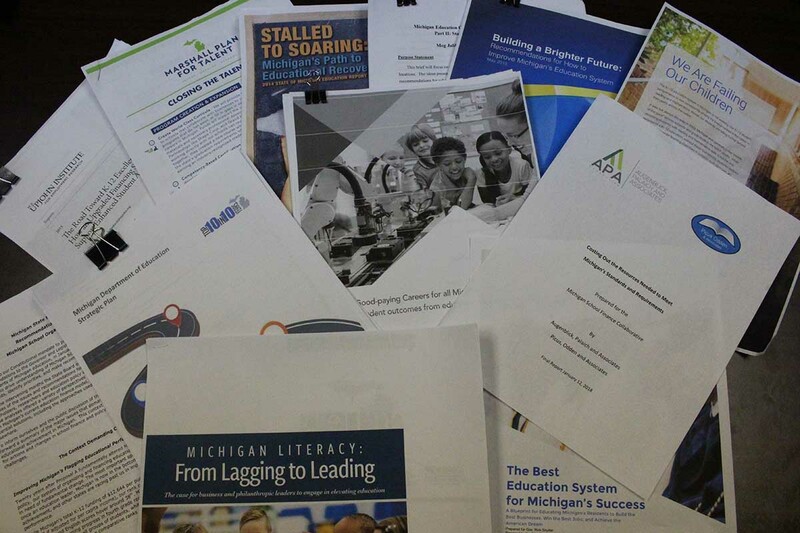 Here are quickie summaries of 12 reports written about Michigan education reform, with links (if you have time) to the fuller reports. WHAT IT SAYS IN ONE SENTENCE: Don’t be afraid of high, consistent standards and accountability, and be open to spending money in different ways. WHAT IS SAYS IN ONE SENTENCE: Not every student costs the same to educate. Base per-student funding should be $9,350. The base amount now is $7,631, but some districts get more than that. More money for students in special education, career tech or who are English language learners or low-income families. More money for districts with high transportation costs. WHAT IT SAYS IN ONE SENTENCE: It’s time to transform our educational system to align with growing job fields, including many that don’t require a college degree. Partnerships between business and schools to create classes teaching skills for high-demand jobs. Certification/credential programs within high schools. Incentives for current teachers to gain certifications in areas like physics and career tech. WHAT IT SAYS IN ONE SENTENCE: The world has changed, and our schools need to change with it. More high school grads with post-secondary education of some kind. More funds for at-risk students. Eliminate the State Board of Education. Publicly funded pre-K available to all 4-year-olds by 2020, and all 3-year-olds by 2025. State- and district-level professional development for teachers. Different state spending for different students and communities. WHAT IT SAYS IN ONE SENTENCE: Forget that Gov. Snyder Marshall Plan stuff about career tech; the most reliable path to a good-paying career is a bachelor’s degree or higher. Access to high-quality early childhood education for low-income families. Hold school districts accountable for how successful former students are in college rather than standardized tests. More coordination to use research-based strategies to improve early literacy. Master teachers who mentor younger teachers. WHAT IT SAYS IN ONE SENTENCE: Sixteen years ago, the state board sounded an early alarm about early childhood learning. Money for early literacy intervention programs. More literacy training in early childhood teacher certification. WHAT IT SAYS IN ONE SENTENCE: We need to change how, and how much, we spend on education. Money given for specific programs shown to improve learning. WHAT IT SAYS IN ONE SENTENCE: If we want to reverse our downward trend in student achievement, we need to rethink how we invest in education, from cradle to career. Differential funding based on the costs for different schools and students. Expand early childhood education opportunities. Better teacher prep and more teacher training. Consistent school funding to help schools plan. You will not solve school problems until you let teachers teach. All the testing accountability is a waste of money unless you attract and KEEP teachers. How are you doing that? What working conditions are you creating for them? How are you paying them? Why would anyone want the job? It's not rocket science. It's basic. You will NEVER solve your outcomes, till you provide schools with resources and talent. Quite frankly, Republicans with their "business" model have driven away more good teachers and destroyed education in Michigan. Schools don't work on competition, kids aren't widgets to be sold or customers to be scammed. It isn't an assembly line that can be scripted. Something crucial has been overlooked in all of these supposedly learned studies. If Michigan expects to have a first-rate educational system, it must employ first-rate teachers. Although excellent training is vital, Michigan can never provide enough training unless its schools retain those well-trained teachers. This means that Michigan schools must pay--and Michigan taxpayers must pay--enough in pay, fringe benefits, and retirement to attract and retain excellent career-oriented teachers. The reason the Marshall Plan worked in helping rebuild Europe after the war was that it comprised both a short-game (addressing immediate needs) and a long-game (preparing for a sustainable, but not fully foreseeable future). Michigan's current Marshall Plan plays only a sort-game---focused skills training for jobs available right now and (expected) in the near and foreseeable future. Michigan needs a long-game strategy that will prepare students to navigate an ever accelerating evolution of the very concept of "work," some of which we can imagine (e.g., more robotics, AI, etc.) and some of which, today, is not yet imaginable. Adaptability, creativity, imagination, innovation are the skills that will best serve in that uncertain future. Politicians have demonized the teaching profession and made it unattractive to many people as can be seen in the alarming drop in the numbers of people in Michigan who are training to be teachers. I suspect many current teachers are fed up and just going through the motions which can happen in a job where the legislature takes away as many benefits and perks as they can. A system cannot move ahead if people feel disrespected. Thank you John for your thoughtful comment. If we had well developed leaders, who knew how the best organizations in the country are successful, they would know care and kindness of their employees is the only way for them to be successful. I worked in healthcare for many years and the issues there are no different. Employees (especially nurses) are objectified and "tolerated", not recognized that they are producing the product (nursing care). This attitude is systemic in Michigan (businesses are now reaping the karma they have created, unqualified workers). spell check your page here.